Vergenoegd Farm - Worcester Akkommodasie. 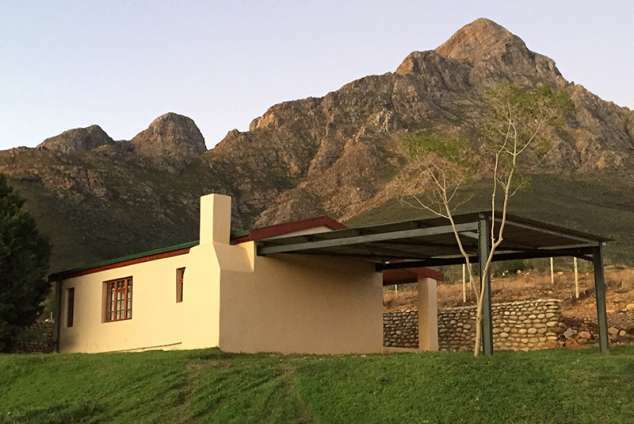 Vergenoegd Farm is located 15km outside Worcester and an hours drive from Cape Town, in the heart of the Olifantsberg mountains in a tranquil environment surrounded by vineyards, pear and apple orchards, fresh fynbos and panoramic views. The farm offers a break away from the hustle and bustle of city life where one can relax without TV and Wi-Fi. Accommodation is available in 2 cottages, Geluk and Serenity. Geluk can accommodate 2 adults and comprises 1 bedroom, 1 bathroom and an open-plan kitchen and dining area. The bedroom contains a double bed, while the bathroom is fitted with a shower, toilet and a washbasin. Serenity can accommodate 4/5 adults and comprises 2 bedrooms, 1 bathroom and a kitchen/dining area. The main bedroom contains a double bed and the second bedroom 2 single beds. The bathroom is fitted with a shower, toilet and a washbasin. Both kitchens are fully equipped for self-catering and contains a two plate stove with oven, fridge-freezer, microwave, cutlery and crockery. Quality linen and towels are provided. There are indoor and outdoor braai facilities at both cottages. Detail description : The Jan S du Toit Hiking Trail starts on the farm. 395 besigtings sedert 11 Feb, 2019. Laas opgedateer op 13 Apr, 2019.